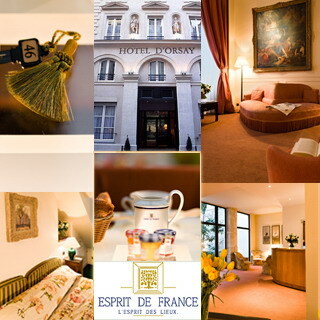 The Hôtel d'Orsay, housed in two beautiful XVIIIth century buildings, is close to the Musée d'Orsay. A delightful patio, pleasant to the eyes, a large and smartly furnished lobby, warmly decorated rooms,classical or modern works of art provide a setting of refinement,comfort and serenity. In the heart of Paris and set in a quiet area, a stone's throw from the Tuileries and Saint-Germain des Prés, the Hôtel d'Orsay opens its doors to Art, gardens and business.